Typically azaleas will bloom in the springtime, although a select breed has been bred to bloom more frequently. The breed known as the Encore series will bloom twice a year, usually once in the spring and again in autumn. With more than 20 varieties of the Encore azalea, choosing the right one for your particular landscape and taste in design proves easy. These plants grow best in sunny areas and will require little to no pruning. 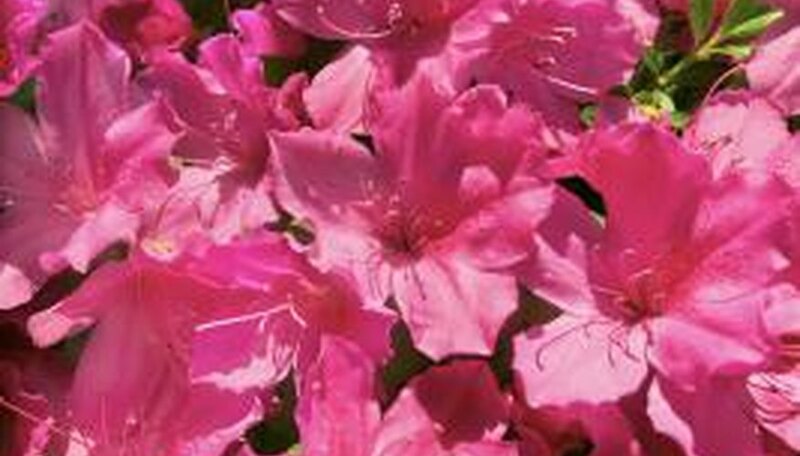 Encore azaleas will thrive in both containers and planted in the ground. The autumn amethyst azalea features single blooms, each approximately 2 inches wide. These plants produce a soft purple- or amethyst-colored flower. During the winter the foliage on these bushes turns into a lovely purple-bronze shade. The autumn amethyst can grow up to approximately 4 feet tall and 4 feet wide. The autumn carnation azalea features blooms of a medium-pink shade. Each bloom measures approximately 2 1/2 inches wide. The foliage on this plant remains a beautiful dark green color year round. These bushes can grow up to approximately 4 1/2 feet tall and 4 feet wide. The autumn ruby azalea, a smaller version of azalea, measures only 2 1/2 feet tall and 3 feet wide when fully grown. Featuring dark green foliage year round, the autumn ruby presents small single blossoms, each only a little bigger than 1 inch wide. These petite blooms will work in both the formal garden or as a small accent plant or border plant. The autumn monarch azalea features striking orange blooms that measure approximately 2 1/2 inches wide. The blooms on this bush may be either single or double. As one of the largest encore azaleas, the autumn monarch can reach heights up to 5 feet and widths of 4 feet when fully grown. This bush features light green foliage all year long.